Composed by Donald Moore. Choral (Sacred); Choral Octavo; Performance Music Ensemble; Single Titles; Worship Resources. 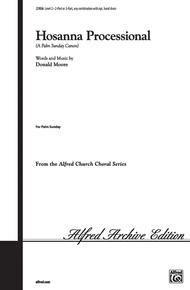 Alfred Archive Edition: Alfred Church Choral Series. Easter; Palm Sunday; Sacred; Spring. Choral Octavo. 12 pages. Jubilate Music Group #00-27856. Published by Jubilate Music Group (AP.27856). English. Psalm 118, Matthew 21:1-11, Mark 11:1-10, Luke 19:28-40. Hosanna Processional" is a flexible canon for any combination of 2-part or 3-part treble or mixed voices. Optional hand drum accompaniment makes this the ideal Palm Sunday procession anthem for adults and children alike. It contains two statements of the "Hosanna" canon with a break in the middle for "Blessed is He who comes in the name of the Lord. The Alfred Church Choral Series (ACCS) includes scripture references and seasonal applications in every octavo. The series includes original works, choral masterworks, and folk, gospel, hymn, and spiritual arrangements. with limited ability and resources.